Bayside is simply a breathtaking place. All the leading National brand name stores you would expect at a great mall, are united at a beautiful waterfront marina in downtown Miami, with the sounds of live music and the smells of the great dining on site. The colors of the urban setting mix with the natural water and sky, with bright Caribbean flavors, and lively rhythms that are uniquely Miami. It is a place to experience the city of Miami at many different levels, and always centered around having fun with great shopping. The Hard Rock Café Miami is at the location, along with a number of other fine dining options. The marina offers a variety of boat tours around the city, an especially popular one is an old sailing schooner that is fully restored, and which sails around, not just under power. It is a beautiful experience. 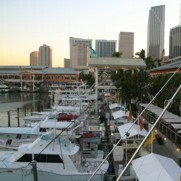 Other unique opportunities at Bayside are fishing charters up to and including Marlin fishing, and taking a walk around to the Freedom Tower, AAA Stadium, Bayfront Park, or the center of downtown. 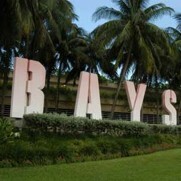 Many souvenir shops, in a quaint crafts area at its center, complete the offering of Bayside Marketplace. A thoroughly enjoyable experience for the entire family! 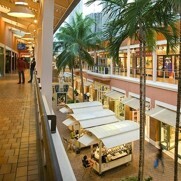 Shopping at Bayside Marketplace is an experience that is an international attraction in South Florida. Don't Miss it!.